This book provides an approachable and concise introduction to seismic theory, designed as a first course for undergraduate students. It clearly explains the fundamental concepts, emphasizing intuitive understanding over lengthy derivations. 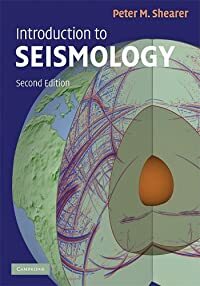 Incorporating over 30% new material, this second edition includes all the topics needed for a one-semester course in seismology. Additional material has been added throughout including numerical methods, 3-D ray tracing, earthquake location, attenuation, normal modes, and receiver functions. The chapter on earthquakes and source theory has been extensively revised and enlarged, and now includes details on non-double-couple sources, earthquake scaling, radiated energy, and finite slip inversions. Each chapter includes worked problems and detailed exercises that give students the opportunity to apply the techniques they have learned to compute results of interest and to illustrate the Earth’s seismic properties. Computer subroutines and datasets for use in the exercises are available at www.cambridge.org/shearer. I purchased this book to teach myself seismology. It is a great introductory, so it’s appropriately named. Shearer writes clearly and concisely, and the book is mostly self-contained. This textbook is very good. The author emphasizes on the mathematical taste in the description of seismic and geologic features. If you look at things on a mathematical perspective, this is the on you must have in your “library”. I really like this little book! The layout is great (no clutter) and easy to read. The font is adequate, the equations clear and the tone relaxed. While it isn’t as in depth as most other books on this subject, it makes for a handy reference. It is a broad overview of the fundamentals of earthquake seismology. I find that it explains some of the more rigorous subject matter in an easier to understand way. If you’re not understanding a subject very well in say, the book: “Quantitative Seismology”, just refer to this little gem and wala…it’s like a lightbulb coming on. I particularly like the section on source theory. It’s like a breath of fresh air. I can’t say enough about how accessible this book is. I recommend it highly. I just finished an intro to seismology course, and this was the textbook for it. It is easy to read and understand, covers most topics well, and is generally a good introductory textbook. It does, however, lack depth. Often I’d finish a chapter and still have a lot of questions on how, exactly, I could apply what I’d learned to a problem. I found this frustrating. By going through the textbook and doing selected exercises one can complete the equivalent of a quarter-long seismology class. Well written and accessible to a wide range of interest levels and mathematical abilities, this book is excellent for anyone with a desire to learn about seismology at a quantitative level. Si cuentas con material bibliográfico (libros, tesis, apuntes universitarios, monografías, artículos, etc) sobre Geofísica y deseas compartirlo escríbenos al siguiente correo: aportes@ingenieriageofisica.com, gustosamente haremos extensivo el material que nos proporciones. Esperamos contar con sus aportes y hacer este Sitio cada vez más completo y de mayor utilidad. Hermano manada el link por que hace rato he querido bajar este libro y esta buenisimo !